Duccio was born in Siena in about 1255. He was the greatest exponent of thirteenth and fourteenth-century painting in Siena. Even if he followed the ancient byzantine painting, he renewed it deeply: he dissolved the metal boundaries and the stereotyped frameworks in a very fluid line, proving to be an early supporter of Gothic rhythm. At the same time he exalted the fantastic colors of eastern enamel. Duccio was the master of Simone Martini and had a series of imitators and followers of different levels. Among his early works there is Our Lady of Crevole found in the Museo dell'Opera del Duomo (New Cathedral Workings Museum) in Siena. You can see clear evidence of the models which inspired him: the schematic drapery and the use of gold from Byzantine painting. During the same period, while Cimabue and his followers tried to represent three-dimensional space and volume, Duccio focused his attention on the elegance of form and the harmony of lines and colors. In 1285 the artist painted a Majesty - key work in Duccio's production, now in the Uffizi Museum- which transformed the solemn Byzantine system in the new Gothic splendor (the splendid throne, the golden mantle) without forgetting the new sense of form that was then proposed by Cimabue in Florence. In 1308 he was commissioned the altar piece of the Cathedral in Siena (now located in the Museo dell’Opera del Duomo), tied to the cult of the Virgin in Siena which was much felt. He depicted the Madonna enthroned among angels and in the back, divided into 26 sections, episodes of Christ's passion are represented . French Gothic influences are evident in the very soft lines of the features and in the choice of colors. The central figure of the Madonna and her child is still linked to Byzantine models because it has a real texture and its volume is disproportionate in comparison with the figures that surround her . It is very remarkable the composition plant as well as the intensity of colors. Another work by Duccio is the Madonna of the Franciscans that is in the National Art Gallery in Siena. This is considered an early work by some critics and a later one by others. The small altar piece has a checkered background typical of French Gothic miniatures. Among the later works of the painter that correspond fully to his painting style, with inspiration drawn from the miniature French Gotic, with a delicate drawing of colors, with rhythimis correspondences, linear, typically Byzantine iconography, we mention the triptych of the Madonna and the Altarpiece Siena. Duccio died in about 1318. Milan is the economical capital of Italy; it was founded by “Liguri” (a population native of the region where Milan is, “Lombardia”), in the 1500 b.C. It is in the heart of the Padana plain, near the Alpi, river Po, river Adda and river Ticino. In Milan there are a lot of famous Italian monuments (for example the Cathedral, the church of Santa Maria delle Grazie, where there is the famous painting of Leonardo da Vinci: “The Last Dinner”, the illustrious theatre of the Scala ecc.). Milan is also important for Piazza Affari, the centre of the Stock Exchange of Italy. A famous poet born in Milan was Alessandro Manzoni, who wrote the “Promessi Sposi”, a very important novel of our Italian literature. Situated on the lagoon that makes it famous all over the world, Venice is the “queen of Italy”; together with Pisa, Genova and Amalfi was a Maritime Republic. If you want to go from one place to another, you can go by boat or by “gondola” (a tipical Venice’s boat); the most important artery of town’s traffic is the “Canal Grande”; it is 3.5 km long. Venice is famous for Piazza San Marco, Ponte dei Sospiri (Whispering Bridge), the Carnival and..... the pigeons. Near Venice there are two famous islands: Murano (for the working of glass) and Burano (for the working of lakes). Some renowned men of Venice are Marco Polo (a famous explorer who wrote “the Million”, dealing with his journey to China), Carlo Goldoni (the best Italian XVI century playwright), Giovan Battista Tiepolo (a famous painter) and Antonio Canal (known as Canaletto): he painted tipical Venetian landscapes. Florence is the most important city of art in Tuscany; a lot of men of culture lived in Florence: Dante Alighieri (the main Italian XIV century poet who wrote the “Divina Commedia”), his friend Guido Cavalcanti, Giovanni Boccaccio (one of the greatest short story writer), Filippo Brunelleschi (an important architect; his master piece is the “Cupola of Santa Maria del Fiore), Donatello (who made “the David”), Sandro Botticelli (who painted the “Primavera”), ecc. Florence is also known for Piazzale Michelangelo (Michelangelo Square), where you can see all the town, and the “Bell Tower” of Giotto, considered the most beautiful in the world. When we talk about Florence we have to remember the terrible 1966 fload that damaged its artistic patrimony. Rome rises on seven hills; it is the capital of Italy and it is considered the “Caput Mundi” (the head-capital of the world). It is rich in history and monuments; among its important monuments we find “Altare della Patria”, “Circo Massimo”, “Colisseum”, “Fountain di Trevi” ecc. But Rome is known for San Pietro Cathedral, the centre of Cristianity and seat of the Pope. Some illustrious men of its history are Leone XII, San Gregorio Magno (two Popes), Cesare Ottaviano Augusto (the first emperor), Giovanni Pierluigi da Palestrina (a famous musican), ecc. Two things characterize Naples: the Pizza and the Coral; Naples is known for its squares (for example Piazza del Plebiscito, Umberto I’s Gallery, where there is a mosaic floor representing the zodiac) and the gulf. Around Naples there are a lot of interesting places, like Pompei, Ercolano, Cuma (hold Roman harbour), Campi Flegrei (where there are some emissions of steam from the lakes). In Naples there is the Vesuvio (a famous volcano); some illustrious men of this town were Torquato Tasso (a poet),Giordano Bruno (a philosopher), Luigi Vanvitelli (who designed the Royal Palace of Caserta). 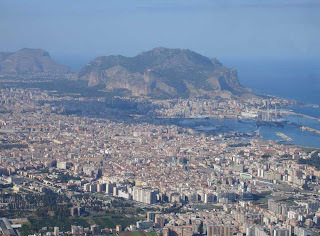 Finally,it is very famous the hill of Posillipo, where you can see all the gulf of Naples.